A Tradition of Excellence, Integrity, Knowledge and Service for over 60 years. At Estey Real Estate, we know what works. We've developed a proven, hands-on approach to management that's served the community for over 60 years. Estey agents are current in all areas of Management and we are 100% committed to serving our clients. Contact us today and make Estey Real Estate your Glencove property management company of choice. Trusted by homeowners, investment owners, real estate professionals and developers, we are committed to excellence and the highest quality of customer support. Please review our services by clicking on the topics listed below. California has the most stringent real estate laws in the country. Protecting your asset(s) is critical and proper knowledge of California real estate laws is essential. At Estey, we make sure that every level of concern is managed with proper documentation and expert knowledge to protect your interests. Call Estey before you take steps with your real estate, personal or investment, to make sure they are the correct steps: 1031-exchange, title transfer, estate planning, investing, leasing or selling. Marketing is key to successful sales and rentals. Estey Real Estate provides a market analysis for each property either for sale or property management. With access to multiple listing services and Appfolio, we have access to data to assist in creating a marketing plan, analysis and other research to maximize your investment. Our goal is to sell or lease your property as quickly as possible. Rental property is listed on our website as soon as property data is collected. Our highly visible yellow and black Estey signs are placed at the property. Our website makes it easy to find your rental or home for sale 24 hours a day. We list with pictures and detailed information. Our goal is to market your property quickly and we update our listings daily. Our listings are transferred to over 70 online website search engines, and this number continues to grow, giving your property the maximum market exposure. We can arrange and place advertising in the local paper if desired. However, we find internet visibility to be very effective. Located on the corner of First and J Streets in Glencove, Estey has the "$1,000,000.00" window of visibility. This window is dedicated to client's properties. All listings are posted and clearly visible to walking traffic. We accept applications with a credit card deposit. We process a complete credit report on each applicant over the age of 18. This report supplies us with the credit worthiness of this person, their amount of indebtedness plus job and rental history. The report verifies their employment, income payment records, unlawful detainers, eviction history, liens, credit scores, late payments, accounts opened, closed plus more. This detailed report helps Estey find the best qualified resident for your property. Exclusive to Estey clients is our Eviction Protection Plan (EPP). This is a benefit offered by Estey to our Estey filled and managed properties. Ask our property investment manager for details. Maintenance of property between tenants. Our office staff is trained to protect your confidentiality. Your information is never released to anyone without your approval except as mandated by a court subpoena. Estey understands the importance of keeping all your personal information safe and secure. All your data is held in a secure environment. We do not sell our client information to third parties. We safe guard your information carefully. Find out about more about Consumer Protection and Protecting Against Identity Theft. Estey Real Estate and Property Management runs a credit report when an application is submitted for an available property. There are three major credit agencies, each using slightly different system to evaluate and arrive at a credit score for each person (Equifax, Experian and Transunion). The score most people reference is the FICO score. The FICO score was developed by Fair Isaac and Company. How long have you had credit? How many open and active accounts do you have? How many times your credit has been checked.? Each of these items plus others are weighed to determine whether or not you qualify for the loan you are requesting. Plus, each company evaluates your credit differently. FICO scores range from 300 to 850, the higher the score, the better credit risk. Please be advised that some websites that advertise "Free credit reports" are not necessarily free. You may keep abreast of your credit by running a free credit report from each agency once a year. Often people run credit reports from one of the companies every 4 months to check their credit report. For example: January 1 run a credit report using Equifax; May use Experian; September use Transunion, then in January start again with Equifax. It is free. If you use all three at one time, you cannot get a free report for another year. AnnualCreditReport.com is the official site to help consumers to obtain their free credit report. You will never receive an email directly from the Annual Credit Report Request Service. We provide tenant payments and reports to you on a scheduled date. Proceeds can be sent to you or your bank. We tailor our program to fit your needs. We can pay any or all of your bills, including utility payments, mortgages, insurance and taxes. When your tenant vacates, we provide accounting of the security deposit. All appropriate charges will be assessed and any remaining amounts owed will be reported or pursued. Inspect property and recommend maintenance. Creatively advertise your unit through the Estey website and connected network. Place an ad for your home in our First Street Office window. Thoroughly verify and screen the applicant. Collect the first month's rent and security deposit. Execute a California compliant lease/rental agreement with addendums. Use a Professional Accounting system to transfer funds to you. Transfer the original documents and pertinent information to you for your continued management*. *Upon transfer, owner takes responsibility of following current tenant laws and future changes in the law. Leases & Rentals: All tenants are required to sign a rental agreement. 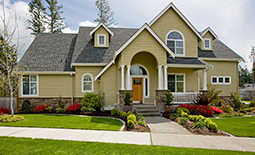 Estey Real Estate has developed many clauses that protect both the owner and tenant. The required disclosures are included to insure compliance with Federal, State and local legal requirements. Collections: Rents are due on the first and considered late if not paid by the third of the month. We are very proactive about rent collections and we will work hard to get your paid on time each month. Estey can provide services to aid banks with Real Estate Owned (REO) properties. Estey can help builders sell homes they have built by managing the property to reduce the chance of foreclosure.